Sunday, I discovered a new form of poetry. A mash up between found poetry and bibliomancy. This poem is constructed from randomly chosen fragments of three different books. Line one comes from Simon Kindt’s No Revelation, two from Tim Winton’s The Turning and three from Amanda Oalmers The Art of Asking. This is just the first taste of what’s to come. Earlier this month I shared my cut-up poem. Yesterday I had the pleasure of performing it as part of my set at the SpeedPoet’s Call Back Finals. And allowing myself a moment of additional reflection, it’s a year since I first put down the first few dodgy lines of what became ‘Paper Mâché’ in the cafe area of an indoor playground post corporate Christmas party (and NaNo and 79,000 words in 28 days!). The first time you step onto a stage to perform, the last thing in your mind is winning. In fact, I’d only ever been to SpeedPoets once, to the 2013 final and had no real idea how the whole thing worked. So I was a bit gobsmacked when Simon Kindt announced back in April that I had won the Call Back slot for the month. Since then I’ve been silently (and more recently, not so quietly) stressing about performing eight minutes of poetry. In the last few months, with my self esteem and confidence bottoming out to a new low, the prospect of writing new poetry, practicing and performing felt entirely overwhelming. Two weeks ago, I started to catalogue in my head what I already had and hadn’t read over the course of the year. I’d been hording ‘Paper Mâché’ just in case I didn’t write anything new–which was lucky, because I hadn’t written a whole lot. There was ‘How Fossils Form When Conditions Benefically Interact’. And upon opening No Need to Reply to look at ‘Eclipsed’, the poem that closes the collection, I hit on turning the final piece ‘Closure’ into a poem. With a few simple tweaks, and then a few extra lines last week, it became ‘Body Warmth of Beginners’, a title I’ve had in my notes app for a very long time. On the first run through, the three poems came in at 8 minutes and 11 seconds and I knew I didn’t have to look any further. Sometimes you can just be lucky. For the last two weeks, while I battled a renewed plunge into depression, I practiced when I could–inflicting the set on unsuspecting friends (thank you Rob and Rowena) when the opportunity arose. Although I wasn’t able to get up and perform from memory yesterday, as I had hoped I’d be able, I was actually able to perform the poems, rather than just read them. And because I knew the poems well enough, there was a chance to engage with the audience from the stage during my set. There was this lovely moment, where I zoned in on a couple sitting to the right hand side of the stage and I whispered into the microphone ‘his lips pressed to the inside of her wrist’. Chris Lynch (who read the most exquisite and sensual poem about mangoes!) and savanu (who did not crucify himself on stage although he assumed the stance of the crucified) tied as Call Back Poet of the year. But there was so much excellent poetry – Vanessa Page’s closing line was among my favourites. As a new poet and a beginner performer, it was an honour to stand on stage yesterday with more experience performance poets. Many thanks to Helen Stubbs and Ben Payne who came along as my pit crew. Thanks also to Sean Wright and Stacey Larner who were exposing me to poetry long before I thought I might even have a chance to writing it. And also to Andrew Phillips, who insisted before he left the country, that I stop calling myself an ‘accidental poet’ and instead embrace it. At the start of the week I had the happy news of the publication of my first ever poem. Today I have the slightly mad news (I woke up this morning to find it wasn’t a beer-induced hallucination!) 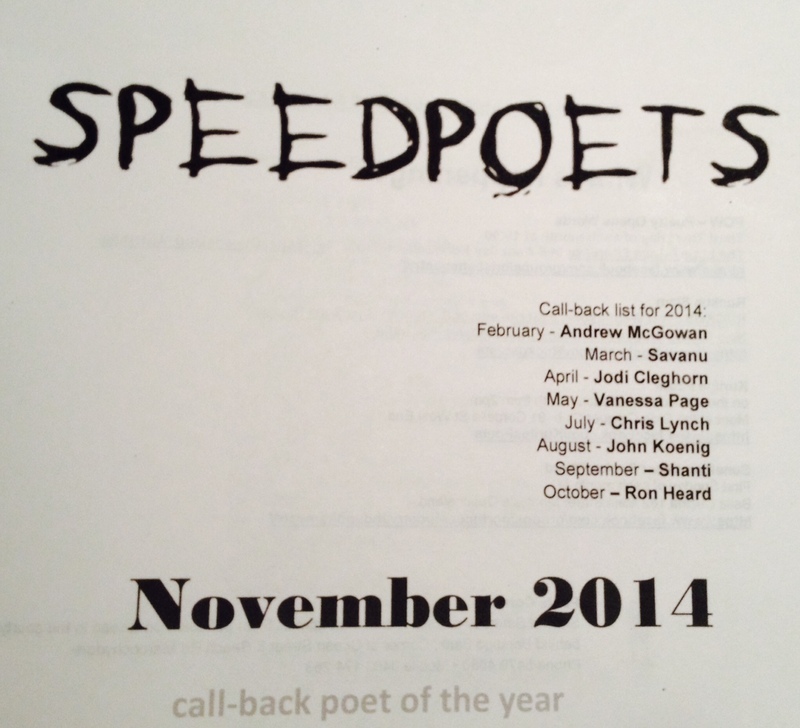 that I am SpeedPoets ‘call back’ poet for April. This all happened quite by accident and I still feel as though I gate crashed someone else’s party. Stacey encouraged me to go along yesterday, (she was planning on reading and said I had to do it too!) and Friday during the write-in we read to each other a collection of poems and picked the ones we felt worked best. But I was doing this all as an act of support (for Stacey) and to keep pushing my own boundaries. The beer flowed, the poems washed over us, it was good to among good friends and it was generally just a brilliant afternoon (after a bit of a shaky start!) The three of us (Stacey, Tom and I) all had a crack. There were spaces in the final set so Stacey and I read a second time. I had completely forgot about the ‘call back’ component of the open mic segments, so when Simon Kindt (whose poetry absolutely blew me away when I heard him perform at the finals of the call back poets last year) read my name out, I was stunned. To have Simon pick me adds an extra aura of surrealness to it. ‘Almost‘ is the poem that won me the spot (I say it was the poem because my nerves almost choked me when I was reading). It was inspired by memories of the movie ‘Blue Velvet’ from decades ago (the walk down memory lane triggered by a failed attempt to see ‘Blue Velvet’ on the big screen). Many thanks to The Hideaway and to Andrew for being the most welcoming of organisers and MC. So, I guess I will be writing more poetry between now and then. And perhaps have to revise my accidental poetic definitions of self.